The Butcher of Gujarat: Is Modi’s India flirting with fascism? ‘In this episode of Head to Head, Mehdi Hasan challenges Ram Madhav, National General Secretary of India’s ruling BJP and former spokesman of the Rashtriya Swayamsevak Sangh (RSS), the right-wing Hindu nationalist organisation and ideological wing of the BJP.- Published on Dec 25, 2015′. ‘On The Laura Flanders Show: Author/activist Arundhati Roy on the Annihilation of Caste, B.R. Ambedkar and the Western myth of Mahatma Gandhi. And Glenn Greenwald addresses diversity concerns about his new media venture TheIntercept.com. Published on Oct 21, 2014′. 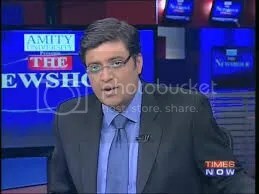 ‘Narendra Modi speaks exclusively with TIMES NOW‘s Editor-in-Chief Arnab Goswami on Frankly Speaking, his first interview to an English news channel since being announced as the BJP’s Prime Ministerial candidate. Modi speaks on the issue of the Election Commission blocking his Varanasi rallies, the battle with the Gandhis, Priyanka Gandhi’s ‘neech rajneeti’ barb, controversies raked up by his party leaders Amit Shah and Giriraj Singh, 2002 Gujarat riots, snoopgate, businessman Adani controversy, the Robert Vadra issue, bitter fight with Mamata Banerjee, BJP confronting with other parties, caste and religion playing a role in election campaign, whether his economics is more swadeshi or pro-market, and if terror and talks can continue simultaneously with Pakistan (8 May 2014)’. ‘Simon Reeves is in Mumbai in western India (in Maharashtra, to be precise) during the celebration of the elephant-headed god Ganesh (also known as Ganesh Chaturthi). There he witnesses a giant statue of the deity, among many others, being carried down to the sea at the culmination of the festival (26 April 2014)’. 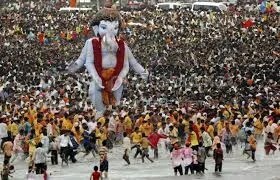 The India specialist Dr Robert Brown opines that Ganesh “is often said to be the most worshipped god in India. As the lord of beginning, he is worshipped by devotees of other Hindu deities — of Shiva, Vishnu, the Goddes — either as the initiator of the path to these deities or as the direct road to mundane goals and success. He is also worshipped by some as the primary god”. Robert L. Brown, Ganesh: Studies of an Asian God (New York, 1991), p. 1. http://www.google.com.tr/books?hl=en&lr=&id=oF-Hqih3pBAC&oi=fnd&pg=PR7&dq=ganesh+hindu+god&ots=nG24gsGzJP&sig=-L66igTyZvhc1kaMZFlx9-0e1_U&redir_esc=y#v=onepage&q=ganesh%20hindu%20god&f=false. Now India’s marathon elections are over — nine voting days spread out over five weeks — and the BJP has gained an even bigger landslide victory than expected, the world’s leader Barrack Obama sees an opportunity to make a buck or two. 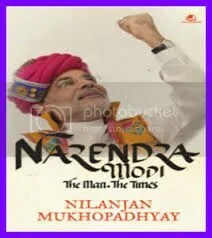 As reported by Al Jazeera‘s Rosiland Jordan, “[n]ine years ago, the US rejected Narendra Modi’s application for a visa. But in a phone call in the past few hours, US President Barack Obama has invited him to visit” (16 May 2014). In his Op-Edge on the Indian elections, the New Delhi-based journalist, author and strategic analyst Rajeev Sharma writes that the “Bharatiya Janata Party (BJP) stormed into power on Friday [, 16 May 2014] riding on the crest of a Narendra Modi tsunami which gave a clear majority to a single party for the first time in India for 30 years and swept the ruling Congress into oblivion. It has become the worst-ever electoral performance by the Grand Old Party [aka the Ghandi-led Congress]. With Modi emerging as the undisputed strong man of India, this will have its own implications for the world”. The Edward Said Chair at the American University of Beirut Vijay Prashad then writes that in 1984 “the Congress Party led by Rajiv Gandhi secured 414 seats (out of the 533 seats in the Lok Sabha, the parliament). Mr. Gandhi’s mother, Indira, had been assassinated not long before the election, and the Congress won decisively on a massive sympathy wave. It did not matter to the electorate that the Congress had engineered an anti-Sikh pogrom that resulted in the death of 3000 Sikhs in two days. The 1984 election was the Congress’ largest victory yet. In the 1984 election, the Hindu Right’s Bharatiya Janata Party (BJP) won only 2 seats. This year, the tide has turned. The BJP is projected to win a large majority, not near 414 but as decisive. It did not stop the Indian voters that the BJP leader, Narendra Modi, is accused of having a hand in an anti-Muslim pogrom in Gujarat in 2002. The Congress, led by Mr. Gandhi’s son, Rahul, has posted its lowest ever total. It will limp into second place. India will now have a powerful Hindu Right government with a very weak opposition. It is the worst of all worlds. To come to power, the BJP wiped out several major political parties across northern India – the major parties of Uttar Pradesh (BSP, SP) and of western India (including the NCP). It also decimated the Congress”. Prashad goes on to explain that the “Congress-led United Progressive Alliance (UPA) has been in power since 2004. In the first UPA, the Congress’s commitment to neo-liberal policies had been constrained by a substantial Communist bloc with which it had to ally in parliament. Despite that, the Congress was able to deepen its LPG agenda – liberalization, privatization and globalization, an explosive mix that brought India in line with the planet’s rising inequality. An Indian Planning Commission study from December 2012 found that urban inequality was rising “steadily over the years, with a sharp rise in the 2000s. This rate of inequality exacerbated the condition of deprivation suffered by 680 million Indians, according to a study by McKinsey & Company. The McKinsey study suggested that the “empowerment gap,” namely the additional consumption needed to bring the deprived Indians to the “Empowerment Line,” is seven times greater than the cost of poverty elimination. The Congress led government fell short not only of bringing the population to the poverty line (which is very low), but it was no-where near providing an agenda for the 680 million who were below the Empowerment Line. The policy slate of the Congress-led UPA intensified inequality, allowing a narrow slice of the Indian population to accumulate vast amounts of wealth and another slice to benefit from the expenditures of this small moneyed elite. Policy options that sought to enhance the entrepreneurial class as the engine of growth also provided that class with the mechanisms to benefit through corruption. The number of scandals that rocked the second UPA government (2009 onward) began to define the administration of Dr. Manmohan Singh. By the time the Indian electoral went to the ballot, they saw the Congress as the party of corruption. That was something that the incumbent party could not shake . . . The BJP’s record in governance is not any different from that of the Congress – with inequality and corruption being the order of the day in its bastion of Gujarat, for instance. To take one indicator as illustrative, in Gujarat the mal-nutrition rate is so high that it is worse than the average level of malnutrition in sub-Saharan Africa (where the rates of mal-nutrition remain very disturbing). Gujarat’s ‘development model’ also favored the privileged businessmen of the ruling party, the BJP, and its chief minister, Narendra Modi. Family firms such as the Adani group earned substantial gifts from the BJP government, which enhanced their profits, and helped Gujarat increase its own profile as “open for business.” Modi was able to dodge questions of the “Gujarat Model.” He was quickly anointed by the BJP as its Prime Ministerial candidate and hastily favored by the media with far more coverage than any other politician. Modi ran as the development candidate with a carefully calibrated argument – he suggested that it was not neo-liberalism that created inequality, but its symptom, namely corruption, which the BJP tied to the mast of the Congress. In other words, the BJP never ran against the roots of inequality or deprivation, but only what it deemed to be its symptom – corruption. This was a clever strategy. It both rode the anti-Congress wave, which had been produced by anger at the inequalities in the country, and it mollified the corporate community, which would not have been interested in any criticism of the policies of neoliberalism. Unlike the rest of the BJP leadership, Modi had no need to take recourse to the language of the Hindu Right. He had been the Chief Minister of Gujarat during the riot, and despite no finding of guilt has worn the odor of responsibility. A man of the Right, Modi simply had to gesture toward his base to comfort them about his commitment to their ideology and demands: it was sufficient to journey to the headquarters of the powerful Hindu nationalist organisation called the Rashtriya Swayamsevak Sangh (RSS) – the brain center of the Hindu Right – was one indicator, and to deliver his wink and nudge speeches about Muslims and their need to be Indian. He did not have to ride on the chariot of the Ram Temple in Ayodhya, although not one of his hard right supporters doubted his commitment. It freed Modi up to be the pro-Business leader rather than the anti-Muslim one. It was a campaign run with a masterful touch”. And what does this new wave of Hindu Nationalism mean for the rest of the world??? Business opportunities for the world’s movers and shakers and a docile Indian workforce perhaps??? And how does Modi compare to other world leaders that have come to power on a wave of religious and chauvinistic sentiments??? According to the Modi biographer Nilanjan Mukhopadhyay, the prospects appear bleak, or maybe even bleaker than bleak: “[t]here was one observation routinely made by almost everyone I interviewed while researching for this book [Narendra Modi: The Man, the Times] — that Modi did not like to listen to any other viewpoints besides his own, that he was authoritarian and did not allow any of his peers to acquire a distinct identity and thereby even remotely pose any threat to him. Most people said that this also reflected a basic insecurity in his personality — a major flaw — and that he was using power to demand — and secure — subservience from those around him. On this matter, most people I interacted with felt that Modi was among the least democratic leaders”. Rajeev Sharma. “‘Modi-fied’ India: Implications of BJP’s landslide win” Op-Edge (16 May 2014). http://rt.com/op-edge/159536-modi-india-election-victory/. Vijay Prashad, “An Anti-Congress Wave in India Propels the Hindu Right to Power” The Brics Post (16 May 2014). http://thebricspost.com/an-anti-congress-wave-in-india-propels-the-hindu-right-to-power/?fb_action_ids=10152419786631678&fb_action_types=og.likes&fb_ref=.U3ZDxDvNLHk.like&fb_source=aggregation&fb_aggregation_id=288381481237582#.U3ciiZNrP4h. Vijay Prashad, “An Anti-Congress Wave in India Propels the Hindu Right to Power”. Ryu Spaeth, “India’s Narendra Modi and the threat of Hindu nationalism” The Week (16 May 2014). 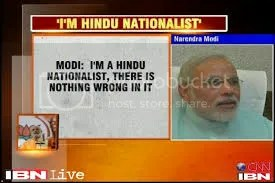 http://theweek.com/article/index/261658/indias-narendra-modi-and-the-threat-of-hindu-nationalism. India Votes 2014: Congress Out and BJP In??? ‘Voters in India are choosing their next government, in what is the world’s biggest election, where more than eight hundred million people are eligible to vote.Al Jazeera reporters are on the ground in several key places.Sohail Rahman reports from New Delhi, Nidhi Dutt is in Muzaffarnagar, and Faiz Jamil is in Gurgaon (10 April 2014)’. The leader of the BJP Narendra Modi is a man with a frightening reputation: in 2002, when he was Chief Minister of the state of Gujarat it is alleged that he initiated and encouraged violence against Muslims, thereby leading to the deaths of about 2,000 people . . . earning him the nickname the Butcher of Gujarat. And now Modi is on the verge of becoming India’s next Prime Minister, as he seems much favoured by India’s business class. As reported by Sangeetha Kandavel and Sanjay Vijayakumar: “Murugappa Group Chairman A Vellayan chastised the Congress-led [United Progressive Alliance] and all but supported BJP’s prime ministerial candidate Narendra Modi in a rare instance of political candour from a conservative business family. In an exclusive interview . . . the chairman of the Rs 22,500-crore group . . . said the UPA government had announced many well-intentioned policies but did not implement them”. In other words, it seems like a foregone conclusion that India will once again be ruled by the Hindu Nationalists or the Bharatiya Janata Party (BJP) for the foreseeable future. Sangeetha Kandavel and Sanjay Vijayakumar, “Narendra Modi government would be positive for the economy, UPA a disaster: Murugappa Group chief A Vellayan” ET (10 April 2014). http://economictimes.indiatimes.com/news/news-by-company/corporate-trends/narendra-modi-government-would-be-positive-for-the-economy-upa-a-disaster-murugappa-group-chief-a-vellayan/articleshow/33521949.cms. The news agency Reuters‘ Robert Evans reports that in “13 countries around the world, all of them Muslim, people who openly espouse atheism or reject the official state religion of Islam face execution under the law, according to a detailed study issued on Tuesday. And beyond the Islamic nations, even some of the West’s apparently most democratic governments at best discriminate against citizens who have no belief in a god and at worst can jail them for offences dubbed blasphemy, it said. The study, The Freethought Report 2013, was issued by the International Humanist and Ethical Union (IHEU), a global body uniting atheists, agnostics and other religious skeptics, to mark United Nations’ Human Rights Day on Tuesday [. 10 December]”. The International Humanist and Ethical Union (IHEU) was founded ‘in Amsterdam in 1952 [and] is the sole world umbrella organisation embracing Humanist, atheist, rationalist, secularist, skeptic, laique, ethical cultural, freethought and similar organisations world-wide. [Its] vision is a Humanist world; a world in which human rights are respected and everyone is able to live a life of dignity. The mission of IHEU is to build and represent the global Humanist movement that defends human rights and promotes Humanist values world-wide. IHEU sponsors the triennial World Humanist Congress. Based in London, IHEU is an international NGO with Special Consultative Status with the UN (New York, Geneva, Vienna), General Consultative Status at UNICEF (New York) and the Council of Europe (Strasbourg), and maintains operational relations with UNESCO (Paris). IHEU has observer status at the African Commission on Human and People’s Rights’ and the ‘long term strategic aims of IHEU are: To promote Humanism as a non-theistic life stance throughout the world. To represent Humanists within the international community and organisations. To defend human rights and the rights of Humanists. To develop organised Humanism in every part of the world. To build a strong and effective global organisation’. 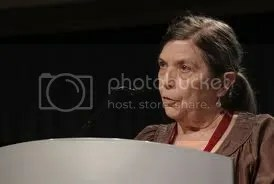 IHEU President Sonja Eggerickx states that “This report shows that the overwhelming majority of countries fail to respect the rights of atheists and freethinkers although they have signed U.N agreements to treat all citizens equally”. [iii] For his part, Reuters’ Evans continues that the “study covered all 192 member states in the world body [, the U.N.] and involved lawyers and human rights experts looking at statute books, court records and media accounts to establish the global situation. A first survey of 60 countries last year showed just seven where death, often by public beheading, is the punishment for either blasphemy or apostasy – renouncing belief or switching to another religion which is also protected under U.N. accords. But this year’s more comprehensive study showed six more, bringing the full list to Afghanistan, Iran, Malaysia, Maldives, Mauritania, Nigeria, Pakistan, Qatar, Saudi Arabia, Somalia, Sudan, United Arab Emirates and Yemen. In others, like India in a recent case involving a leading critic of religion, humanists say police are often reluctant or unwilling to investigate murders of atheists carried out by religious fundamentalists. Across the world, the report said, “there are laws that deny atheists’ right to exist, revoke their citizenship, restrict their right to marry, obstruct their access to public education, prevent them working for the state”. Criticism of religious faith or even academic study of the origins of religions is frequently treated as a crime and can be equated to the capital offence of blasphemy, it asserted”. Evans further writes that the “IHEU . . . said [that] there was systematic or severe discrimination against atheists across the 27-nation European Union. 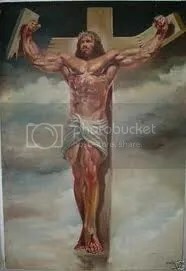 The situation was severe in Austria, Denmark, Germany, Greece, Hungary, Malta and Poland where blasphemy laws allow for jail sentences up to three years on charges of offending a religion or believers. In these and all other EU countries, with the exception of the Netherlands and Belgium which the report classed as “free and equal,” there was systemic discrimination across society favoring religions and religious believers. In the United States, it said, although the situation was “mostly satisfactory” in terms of legal respect for atheists’ rights, there were a range of laws and practices “that equate being religious with being American.” In Latin America and the Caribbean, atheists faced systemic discrimination in most countries except Brazil, where the situation was “mostly satisfactory,” and Jamaica and Uruguay which the report judged as “free and equal.” Across Africa, atheists faced severe or systemic violations of their rights to freedom of conscience but also grave violations in several countries, including Egypt, Libya and Morocco, and nominally Christian Zimbabwe and Eritrea”. Robert Evans, “Atheists face death in 13 countries, global discrimination: study” Reuters (09 December 2013). http://www.reuters.com/article/2013/12/10/us-religion-atheists-idUSBRE9B900G20131210. “About IHEU” IHEU (25 Oct 2007). http://iheu.org/content/about-iheu. Robert Evans, “Atheists face death in 13 countries, global discrimination: study”.